What kind of headlights are those? How have they held up? Not sure, I bought the pair off of Amazon. They are holding up ok so far. Did you do anything interesting with your 4th gen today? take it somewhere, install parts, general maintenance? Post it here! Yes indeed......on the way to Flagstaff, to let my pups run in the snow, the odometer turned the 100000 mile mark... When I got back I checked brake pads. Got to replace the fronts soon, rears good fort another 20,000.... 100K and still ALL original (and I meeeean ALL..not even a burnt light bulb) but for battery and tires! What a car!!!!!! You know....I've been thinking of getting a new car but with all the problems cars have now a days (9 recalls and no replacement parts for the $50,000 VW Atlas alone) I think I'll keep my 4Runner for another 100K miles! And all good to go. Finally installed my Prinsu Rack over the weekend! Watt maker and RonT4R like this. Did some replacement items this past week, I lost one of my inner mud guards so I replaced them with a better thicker set and then my rear window trim was coming apart so I replaced it as well. Cleaned up the headlights Sunday. Where did you get the inner mud guard? Great group to deal with, fast response and shipping. 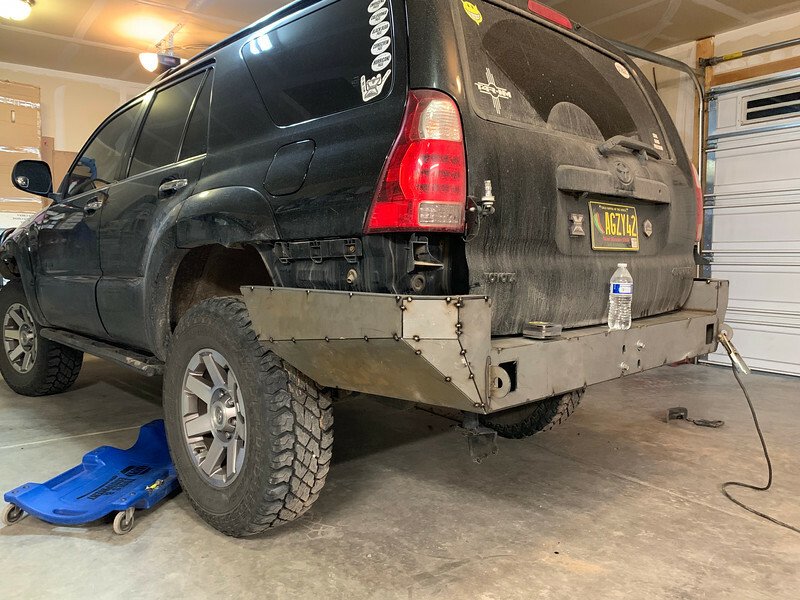 Finally started on the Coastal Off-road rear bumper today. It’s only been sitting in my garage for almost a year. MI-FL off roader, thefatkid, POOLGUY and 3 others like this. RonT4R and Watt maker like this. ADDED A REAR LIGHT AND WIRE WITH RELAY THAT ACTIVATES WHEN MY REVERSE LIGHT COMES ON. POOLGUY, HoBoDanny, RonT4R and 1 other person like this. That’s a cool idea! Doesn’t really get in the way or look odd. Removed the stock head unit (6 disc changer) and installed an alpine head unit. Watt maker and HoBoDanny like this. Installed interior LEDs; amber dome lights and door lights, white in both rears (will probably go all amber). Replaced the burnt out panel lights. 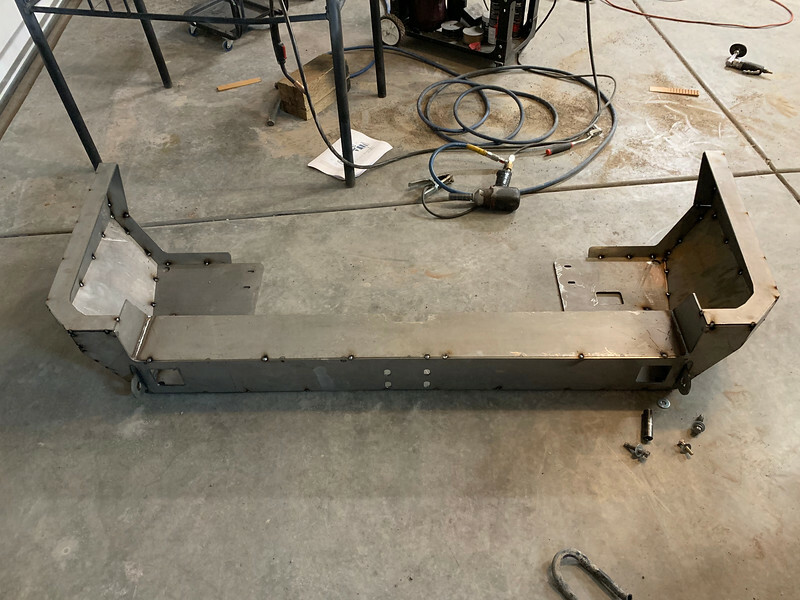 Removed the stock side steps and roof rack, in preparation for a DGG Fab rack in a few weeks. Installed my Greyman Tactical Molle panels for my rifle on my driver seat; as well as two on the rear hatch for misc. gear. Installed QuickFists for my fishing poles and kayak paddles. Installing smoked tail lights tomorrow. 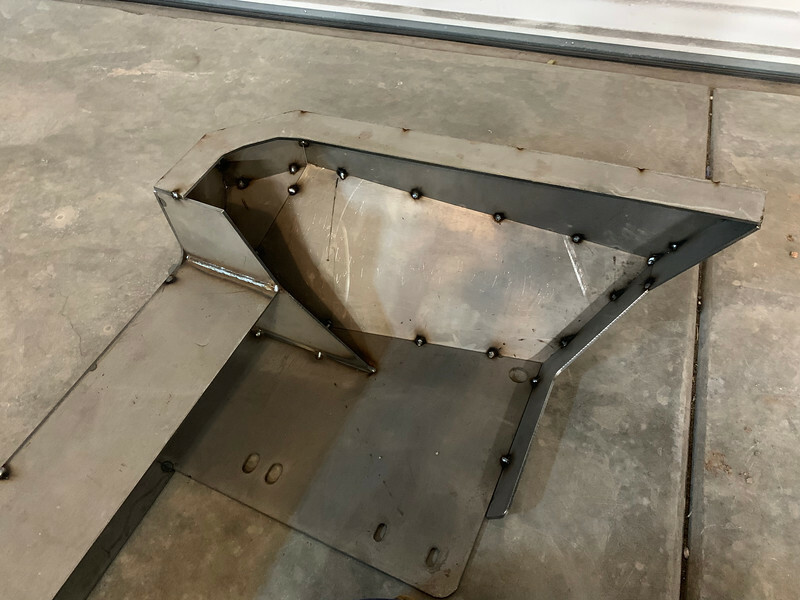 Next weekend I'm installing an LC80 snorkel, CBI ditch light mounts and lights, amber rock lights, amber grille lights, pod reverse lights, and accessory rocker switches for the aforementioned. Well damn! Wasting no time huh? 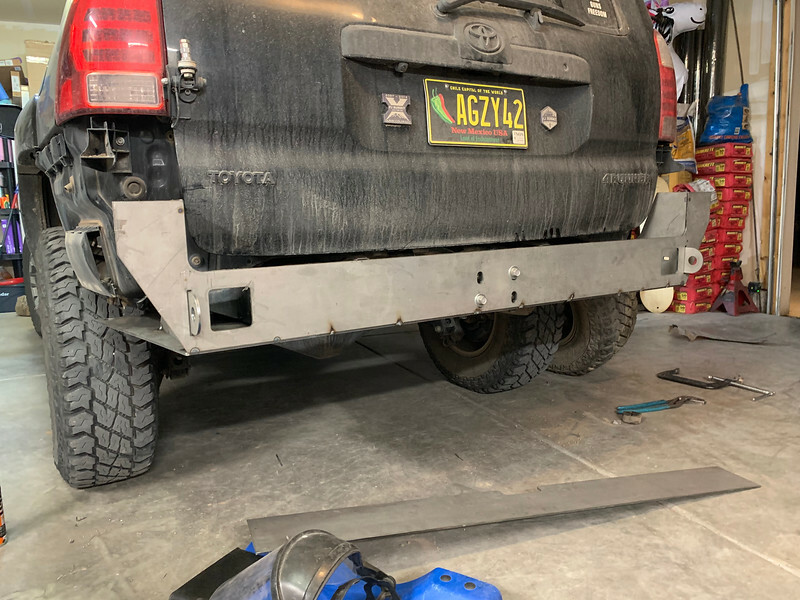 Did a little more work on the DIY Coastal Off-road rear bumper last night. POOLGUY and HoBoDanny like this. 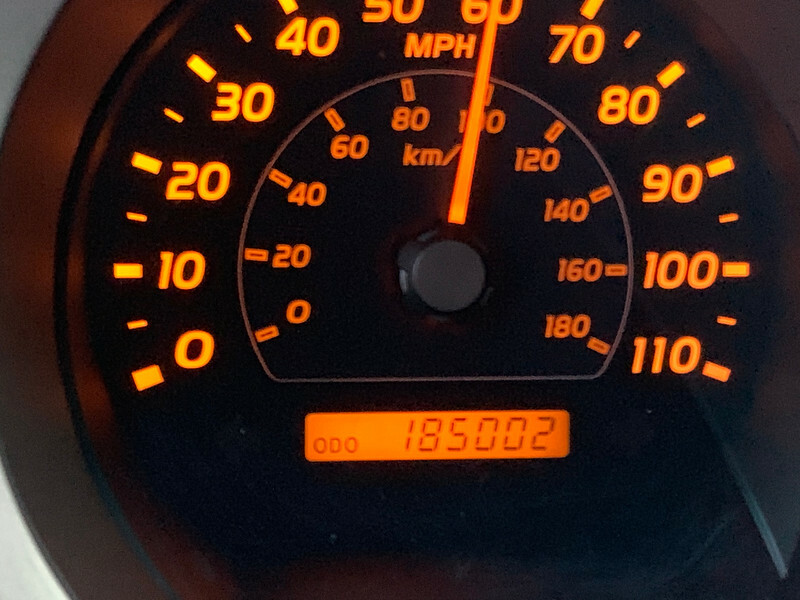 Almost forgot, hit 185k miles this evening coming home from work. Still runs and drives like a champ. HoBoDanny and golfguy like this. Ordered a new dimpled leather steering wheel off of ebay. I didn't get my Wheelskin on my current wheel sewn on quite right and it bugs me to no end. New headlights! Much better the old ones would not stop hazing up. mr5vtps, RonT4R, golfguy and 1 other person like this. The most important mod so I can monitor things. Also added the ATF to XGauge. Watt maker and MattAK like this. I have mine in the same spot... just wish I could pull trans temps! Doesn't pull up in my 2009. Did you have to enable something to get that to show? Flip the trans and water temps and that's exactly how mine is set up. You need to add a gauge in with the XGauge feature. Check your owners manual for the ScanGauge II and it will tell you how. These are the values needed.